The California Sportfishing League (CSL) is warning anglers about Assembly Bill 2787, which aims to outlaw lead fishing weights of 1 3/4 ounce and lower. According to CSL, there is no evidence that lead fishing weights threaten California wildlife. Alternative metals for sinkers cost 2 to 3 times as much, or more, so this could be a hit to the wallet if it passes. CSL is not alone in their opposition - CCA-California is also circulating petitions against the bill. 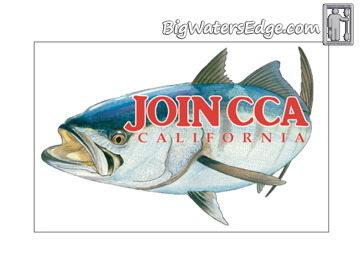 CSL is asking all California anglers to take action by April 2nd. The easiest way is to digitally sign the petition by visiting http://www.savefishing.com/stop-the-...-the-petition/. Consider cc'ing info@savefishing.org. CSL is collecting letters to share with the state legislature. Last edited by PAL; 03-17-2018 at 02:42 PM. They need to concentrate on getting the lead out of their political system, and start concentrating on the real things that need done. CCA CAL will have the petition at the Del Mar Show at our booths and at many of the vendors booths also. took less than a minute to sign. Signed. Lead comes from the soil, why is it a problem if we put it back there. Thanks to everyone who has responded. I agree with Flounder, enough's enough. I recently attended a meeting in Sacramento, where the goal was to increase fishing license sales. It was hard to come up with any good solutions given all the barriers. A lead ban would be one more. I suppose I could see the point if it were proven to impact wildlife, but there are no studies that do so. It's better to have it, and not need it. Disclaimer: I signed the petition. Do any of you really trust research on a topic like this, when the groups funding the research have financial reasons to hope for a specific outcome? I sure don't. I did not sign. Lead is a poison. California is an awesome beautiful state. Protect our oceans and streams. I was on the fence about it. I'm a lot less concerned about lead than I am about plastic, but I'm concerned about both long-term.